The Third Anglo-Chinese Maritime Law & Practice in Transition Conference was held across two days on the 20th and 21st, April 2016 in Southampton University and the UK Supreme Court, London. 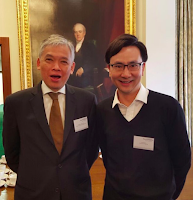 Professor Anselmo Reyes presented a paper entitled “Cross-border Insolvency in Shipping”, while Dr. Felix Chan spoke on “Anti-suit Injunctions: A Comparative Analysis”. Eminent speakers and panel chairs included Sir Bernard Eder (former High Court Judge of England and Wales), Mr. Peter MacDonald Eggers QC (7 King’s Bench Walk), Mr. Michael Davey QC (Quadrant Chambers) and Mr. Richard Lord QC (Brick Court Chambers). Topics examined by the speakers included private international law, carriage of goods, marine insurance, shipping guarantees and cross-border claims.